The Dojo Kun and Guiding Principles form the basis for practice and training within the United Ryukyu Kempo Alliance. In addition to this, the Dojo Kun also forms a good, solid set of guidelines for living life in general. The Dojo Kun, used by traditional karate schools, originated from Shungo “Tode” Sakagawa. Alliance students not only learn to recite the Dojo Kun, but are expected to work towards improving their lives through living the principles of the Dojo Kun. 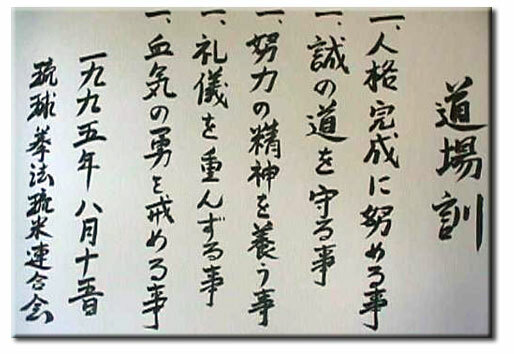 In addition to this, once students reach senior levels, they are required to attain a level of skill and ability in reading these kanji and reciting the Dojo Kun in Japanese.